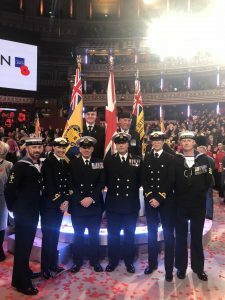 This weekend three Reservists from HMS FORWARD represented the Royal Naval Reserve at the Festival of Remembrance at the Royal Albert Hall. SLt Charlotte Kertrestel, WO1 Steve Bland and LH Anton ‘Aggie’ Christie, were all selected to take part in the prestigious event, which involved parading amongst members of the regular services of the Royal Navy, British Army and Royal Air Force, with the Queen and other members of the Royal Family in attendance. Speaking after the event, SLt Kertrestel said: “Words can’t describe how humbling it was to pay my respects to the men and women who have served, and continue to serve in the Armed Forces. It was definitely a weekend I’ll never forget!”. WO1 Bland and LH Christie, who have served in the Regular and Reserve Naval Service for 41 and 38 years respectively, also saw the experience as a highlight of their career. WO1 Bland, who is due to retire from the Royal Naval Reserve next year, said: “Being able to represent the RNR at the Royal Albert Hall is perhaps the best way to finish my extensive career in the Service”. View a gallery of photographs here.